This is the first in a series of three posts I’ve written for the Austin Food Bloggers Alliance Hunger Awareness Project. I recently joined the Austin Food Bloggers Alliance and we’re all working together with the Capital Area Food Bank to help raise awareness about hunger in Central Texas. For this first post, I’m focusing food education for kids by making healthy, easy snacks on a tight budget– just $16 for two kids’ snacks for the month. $16 is the smallest amount of support the government provides to food stamp recipients, and it’s possible that this small sum could make the difference between a family’s kids eating snacks after school and going hungry. 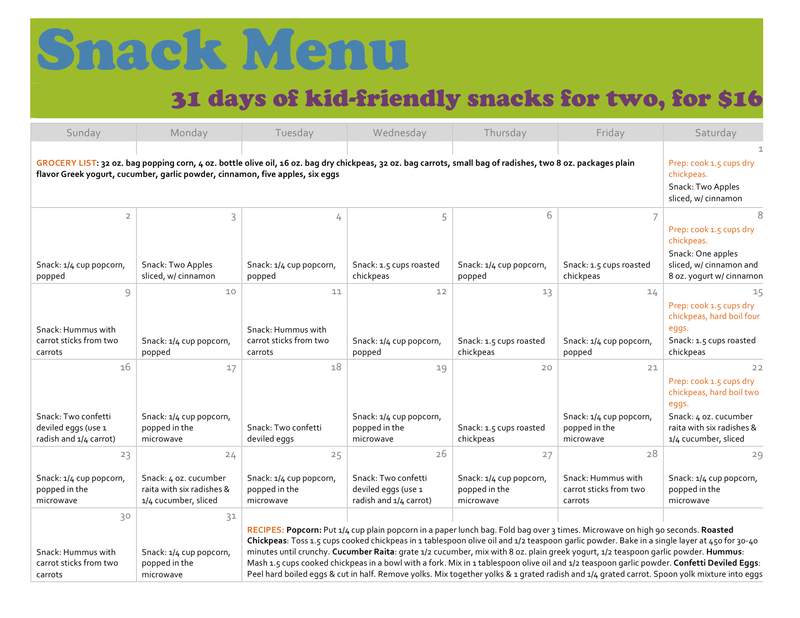 My snack menu features six easy recipes that I imagine children might enjoy preparing and eating. No cookies here. These snacks are all fruits, veggies, whole grains and healthy fats like olive oil. The total cost of all the ingredients for my month’s worth of snacks was $16.02 at HEB, a grocery store on the bus route home from my job. I bought organic eggs, popping corn, and yogurt; the rest is conventional. Shopping for these ingredients made me highly aware of what a sacrifice it can be to cook with high quality ingredients. For example, that tiny bottle of olive oil was twice as expensive as a mid-sized bottle of canola oil. Garlic powder costs three times as much as garlic salt. And organic, free range eggs cost $1.50 more than their factory farmed counterparts. Choosing to cook with these good ingredients meant that I could afford dry chickpeas, but not canned. And I had to settle for five tiny, Red Delicious apples instead of my favorite Pink Ladies or Cameos. Even though shopping for the ingredients was a bummer, I like the snack recipes I created. I think I would have enjoyed eating all these things as a kid, especially the popcorn and the deviled eggs. (Mom? What do you think?) Here are the snacks I prepared with my $16 of groceries. In my instructions, I did my best to keep everything kid-safe, but since I don’t have kids, these are educated guesses. 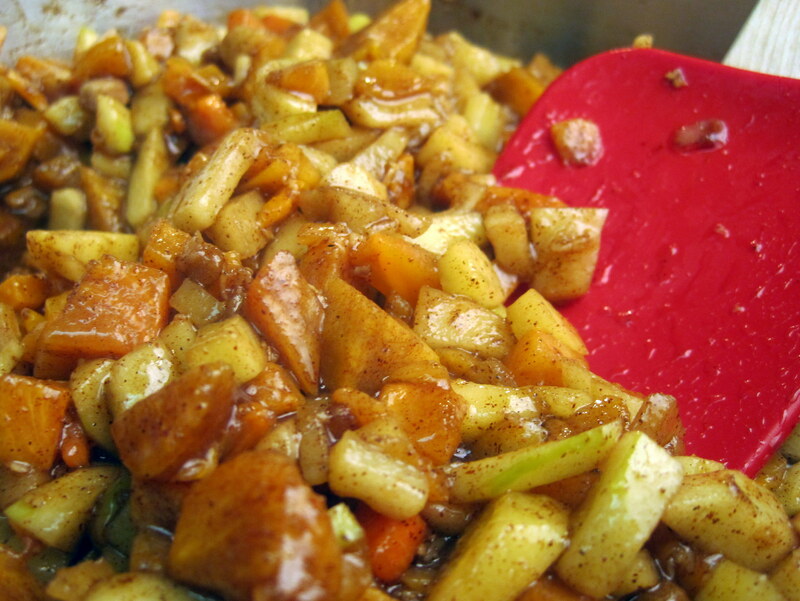 Apple slices sprinkled with cinnamon: Grown-ups should slice apples, kids can sprinkle with cinnamon. Step-by-step instructions. Popcorn: This one’s super easy. 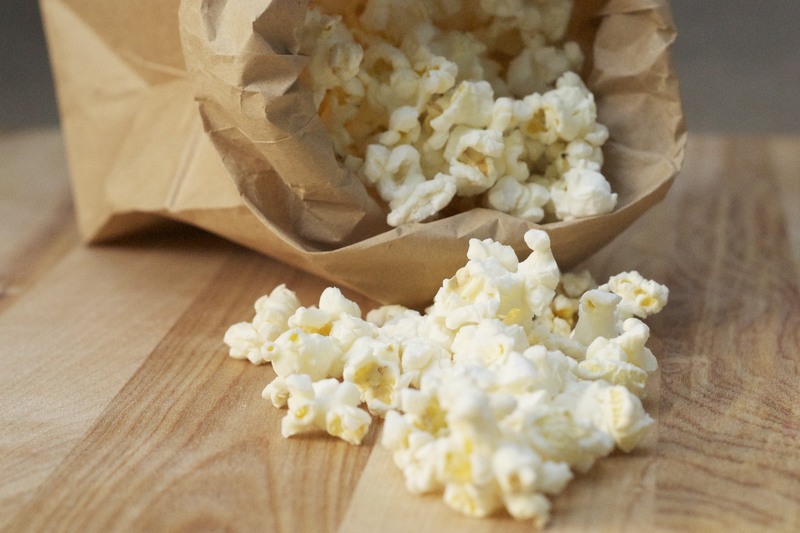 Pour 1/4 cup of popcorn kernels into a plain paper lunch sack. Fold the top of the bag over three times, then cook for 90 seconds in the microwave. Eat the popcorn plain, or sprinkle with garlic powder or cinnamon. Detailed, step-by-step instructions. Popcorn is an inexpensive, healthy snack for kids. Just put 1/4 cup of popcorn in a paper bag, close the top and microwave for 90 seconds. No need to add butter or oil, and it costs less than $.15 for two servings. Carrot sticks with chickpea hummus: Grown-ups should slice carrots into sticks. Kids can make hummus by using a fork to mash together in a bowl 1.5 cups cooked chickpeas, a little olive oil, a tablespoon of water and a heavy sprinkle of garlic powder. The Kid Can Cook has an ingenious, kid-friendly method for making hummus, too. Roasted chickpeas: Kids can use a paper towel to dry 1.5 cups cooked chickpeas, then toss the chickpeas in tablespoon of olive oil with some garlic powder. Grown-ups should spread chickpeas in an even layer on a cookie sheet, then bake at 450 for 30-40 minutes until chickpeas are crunchy. Confetti deviled eggs: Kids can help crack and peel hard-boiled eggs, and grate one radish and 1/4 of a carrot. Grown-ups should cut eggs in half and scoop out yolks. Kids can mix together the egg yolks and most of the grated veggies, and then spoon the yolk mixture back into the egg halves. Garnish with remaining veggie “confetti”. Shredded veggies provide lots of color and texture in this simplified deviled egg recipe. Kids can help peel eggs, grate vegetables and smash together the yolk filling. I used a sprinkle of garlic powder instead of salt for extra oomph. 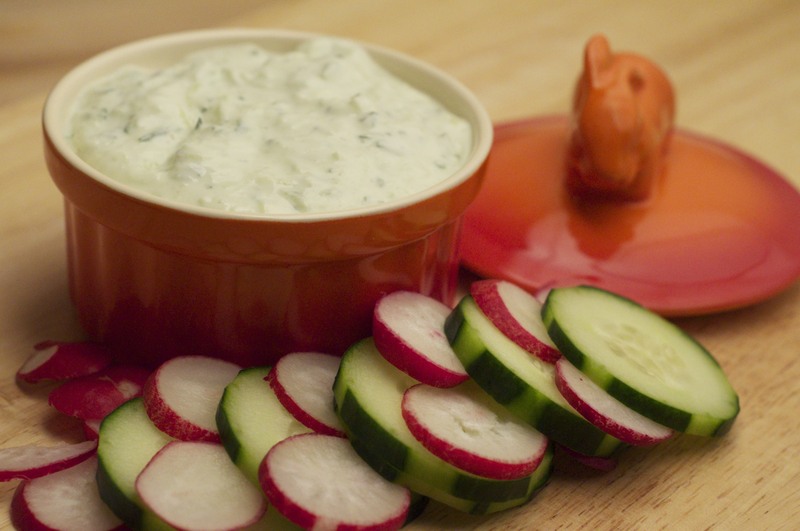 Cucumber raita with radish and cucumber slices: Kids can grate half a cucumber and mix it with 8 ounces of yogurt and a sprinkle of garlic powder. Grown-up should slice the remaining cucumber and radishes. Raita tastes best if it sits in the fridge for a few hours before serving. (This dish is pictured at the top of the page). By using these simple recipes and staggering snacks throughout the month, I stretched $16 of food into 62 servings of snacks. You can see there’s a whole lot of popcorn on the menu, and lots of chickpeas. I tried to alternate these inexpensive snacks with more luxurious offerings like the cucumber raita and deviled eggs. Do you think the snack plan I laid out here is realistic for a single, working parent to carry out? And would kids really eat these things? How would you stretch $16 to help feed your family? Find out more about the Capital Area Food Bank and the Austin Food Blogger’s Alliance Hunger Awareness Project here. I think it’s nearly impossible to walk past fresh strawberries at the farmer’s market without buying a pint. (Or four.) So between our Greenling Local Box and two trips to the farmer’s market last week, I had six pints of local strawberries in the fridge on Saturday morning. Two pints were from Gundermann Acres in Wharton, two were from Naegelin Farms in Lytle, and two pints were from Two Happy Children Farm in Taylor, Texas. So many strawberries won’t keep more than a few days, so I decided to make some jam to use up my haul of berries. I am an inexperienced canner, so Michael Chiarello’s recipe for strawberry preserves seemed like a great place to start: not-to-sweet, and no added pectin. 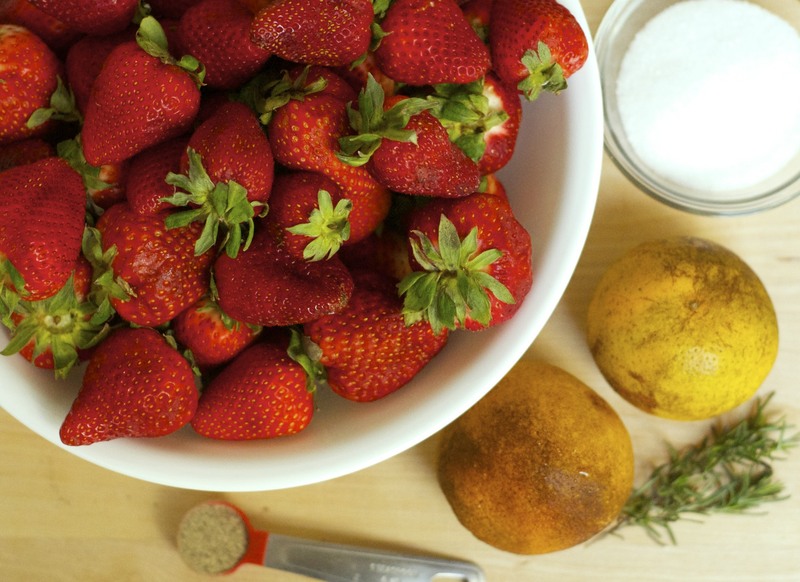 His recipe calls for a lot of berries, some citrus, and a pinch of rosemary and black pepper. I made it my own by substituting oranges for the lemon, omitting the salt, increasing the rosemary and pepper, and cutting the sugar down a bit. The rosemary I used is from Pure Luck in Dripping Springs, and the oranges are from G&S Groves down in McAllen, Texas. Here’s my version of the recipe, scaled down for just one pint of strawberries. In a saucepan with high sides, mix all ingredients and bring to a boil over medium heat. Keep close watch on the pan with a spoon at the ready– strawberries will foam up if you’re not careful! Once the mixture comes to a rolling boil, lower the heat and simmer for 30 minutes, until jam is thick and syrupy. Around the half-hour mark, the consistency of the jam will be thick and the mixture will look glossy. 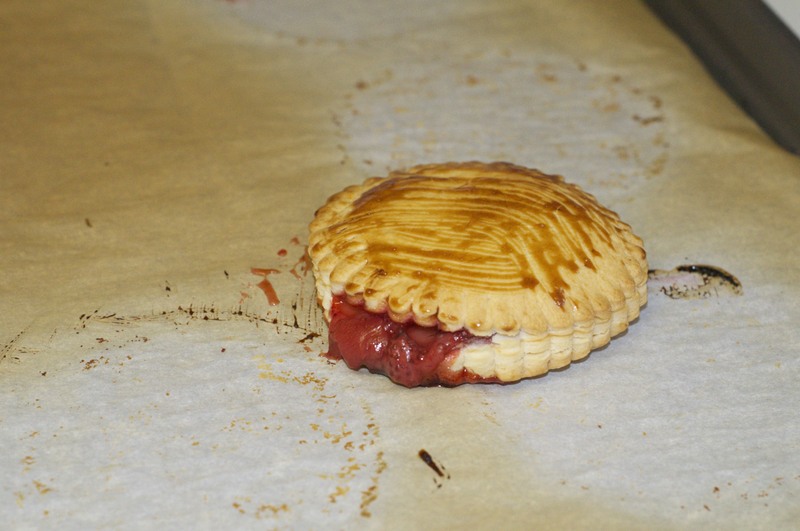 You can test the consistency of the finished jam by spooning a blob onto a very cold plate. Wait a minute, then draw your finger through the jam. If the jam stays separated on the plate, it’s ready! If the jam runs back together, keep cooking. Once the jam is set to your standards, transfer it to a bowl to cool to room temperature. Store in an air-tight container in the refrigerator and use it up within the week. My six pints of berries made a huge batch of the jam, and while it’s not as good as Confituras‘ I am really pleased with my first-ever attempt at strawberry preserves. 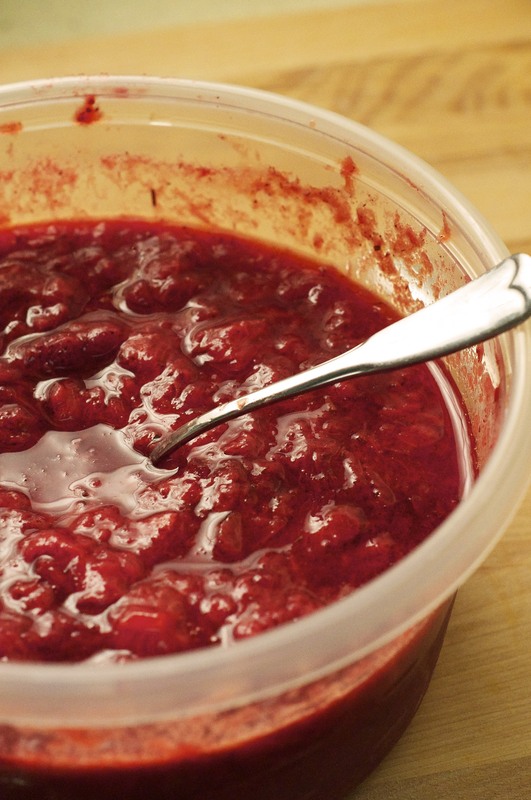 You can see that the preserves have a lovely texture: soft, chopped pieces of berries are suspended in a thick syrup. Homemade jam usually has a softer set than store-bought, and this is wonderful to spread on muffins, toast, or swirled atop oatmeal. Next time I make it I am going to experiment with increasing the sugar and using lemon juice to try to get a brighter flavor from the berries. 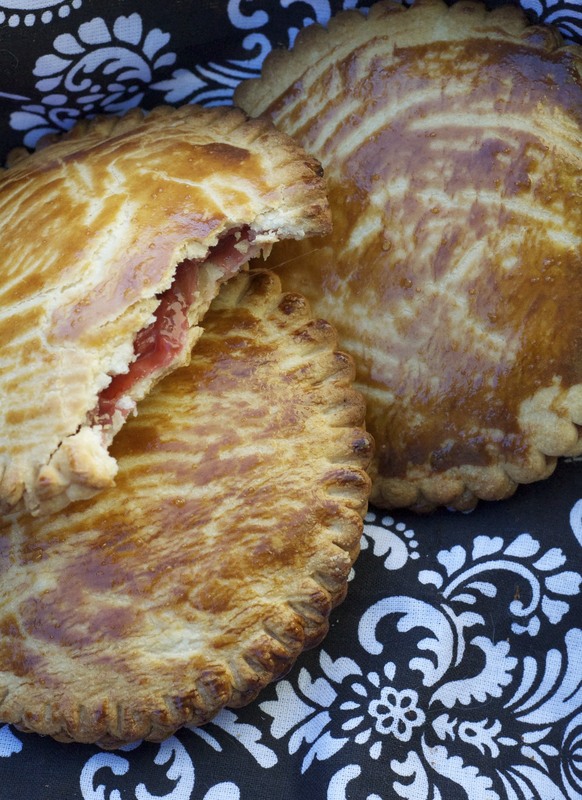 Tonight I used some leftover pie crust and 1/4 cup of the preserves to make these pretty hand pies. They’re kind of like strawberry Pop-Tarts, only they taste like real strawberries and there’s no red food coloring. The finished hand pies were lovely, except for one that I overfilled. A whole chunk of strawberry spurted out of the side of the pie while it was in the oven. I giggled when I saw it because it looked like it was blowing me a big raspberry! Er, strawberry! This is a recipe that almost wasn’t. It came about last Sunday night while I was preparing beer bread and chai truffles for a food swap the next day. I was really nervous about going to the swap, in part because I wasn’t sure whether my dishes would be fancy enough for all the foodies in attendance. This is a common fear for me. I call it Potluck Anxiety, and it tends to sneak up any time I take a large batch of treats to a social gathering. Potluck Anxiety is usually really annoying but in this instance I’m glad I had it, because otherwise I might have never made this spicy arugula spread. Thanks to Potluck Anxiety, I was doubtful that my beer bread would be okay as a standalone dish at the swap. I thought, why not make an herb butter to gussy it up? I wasn’t working from a recipe, just from the vague idea that pesto and butter together would make a good herb butter. So off I went. For the pesto, I improvised using whatever I could find in the fridge: some arugula, green onions, pecans, garlic, salt, and olive oil. When I tasted the pesto I enjoyed it so much that I almost kept the whole batch for myself. Luckily, Potluck Anxiety told me that bread alone wouldn’t cut it, and I pushed forward in the quest for herb butter. To my cup of arugula pesto, I added 4 tablespoons of salted butter. No bueno. 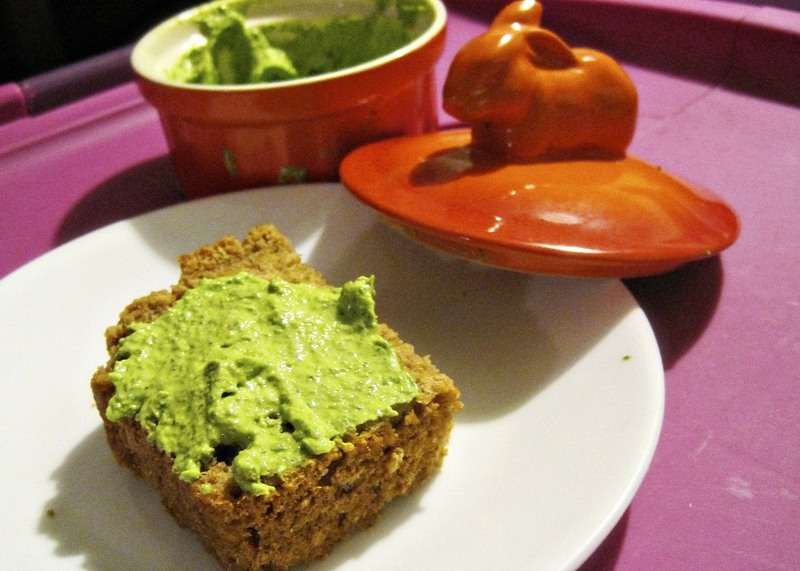 The butter did nothing but turn the pesto into an oily mess! I could have resolved this by adding more butter, but I had used the last of it for the beer bread. What to do? As a measure of desperation, I threw some cream cheese into the processor with the buttered pesto. The flavor of the spread was definitely improved by the cream cheese, but I thought it was still too strong to pair with my mellow beer bread. Not wanting to be wasteful, I put the finished cream cheese-butter-pesto mixture into a crock in the fridge and forgot about it. The night of the swap, I was a mess. I had loaded my car and pulled out of the driveway by the time I remembered the arugula spread in the fridge. In the throes of Potluck Anxiety, I turned around to get it mostly because the little orange crock was so cute. Boy, am I glad that I did! While the spread was sitting in the fridge overnight it mellowed into a lovely, spreadable, spicy dip. Perfect for pairing with crackers or whole wheat beer bread. By experimenting with the leftovers, my husband Rami discovered that this spread makes a great pasta sauce if you warm it up in the microwave. This story has two happy endings. First, I ended up with a new potluck recipe that is easy to put together and a real crowd pleaser. Second, I met a wonderful group of friends at the food swap. There were all sorts of cooks at the party: some were fancy, some were not so fancy, and of them all were kind and accepting. I suspect I will probably have another case of Potluck Anxiety before the next time I see them; my fingers are crossed that I’ll get another winning recipe out of the deal! Place arugula, garlic and green onions in a food processor fitted with the chopping blade. Pulse until veggies have broken down into very small pieces. Add remaining ingredients and pulse until completely combined. Mixture will be very soft from the heat of the food processor; store in an airtight container overnight to firm up the spread and allow the flavors to mellow. Enjoy in place of butter on breads, as a dip for crackers, or warm with pasta. To make the dates, first stuff each date with a bit of cheese or almond, if desired. 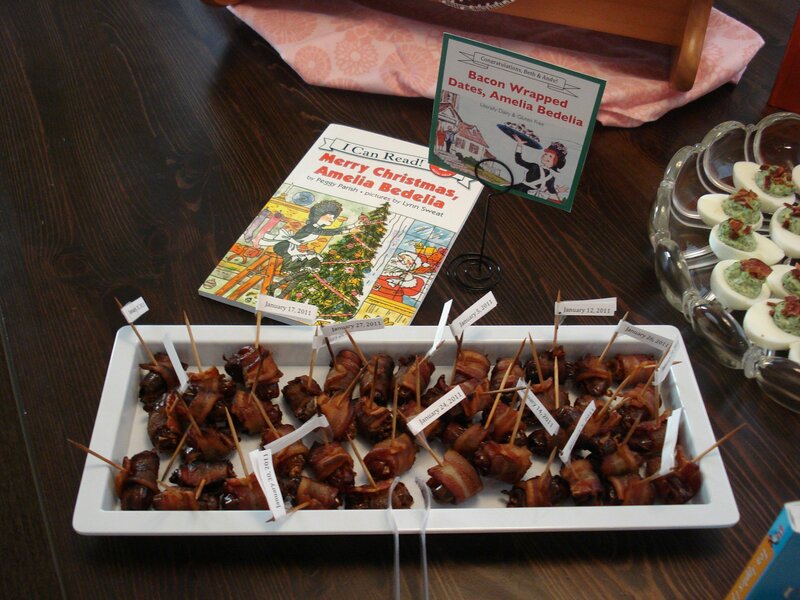 Then wrap each piece of dried fruit with 1/3 slice of bacon and secure with a toothpick. Place wrapped dates on a foil lined baking sheet and season with salt and pepper. (If you’re stuffing them with sweet goat cheese, a little brown sugar sprinkle is nice, too.) Cook in a preheated oven at 350 degrees until the bacon is brown and crispy, about 30 minutes. Turn the dates a few times during cooking to help them brown evenly. Serve hot or at room temperature. Here are the step by step instructions with pictures (and my mom!) in a vintage post. For my sister Beth’s baby shower, we taped paper due dates to the toothpicks of the finished appetizers. I simply typed several January dates on a piece of paper, cut the separate dates into flags, and used a small piece of scotch tape to secure a flag to each toothpick. 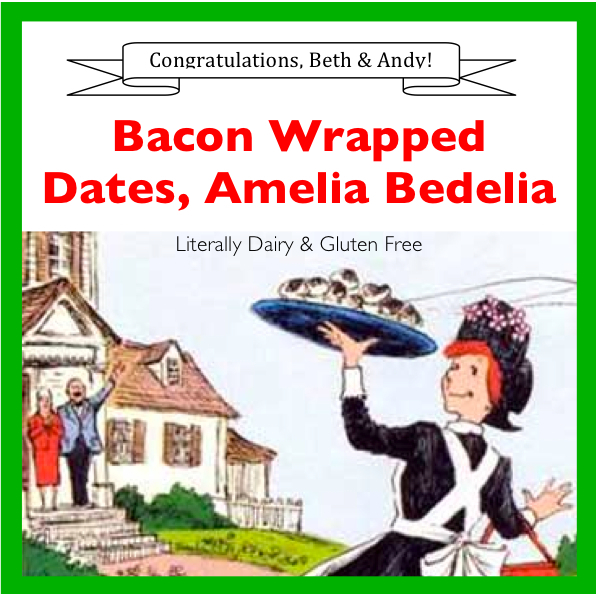 This tied in nicely to the children’s book, Merry Christmas, Amelia Bedelia, in which the ever-helpful Amelia Bedelia tries to make a date cake, using actual paper dates from the calendar instead of fruit in her cake! It made for fun party conversation to discuss the literal-minded Amelia Bedelia, and to speculate on Beth’s actual due date. These savory muffins call for a whole head of kale, plus protein-rich cheddar cheese, making them a healthy and filling option for breakfast on the go. You’re going to have to take my word for it that these muffins look good. I made a batch of them for us to take on vacation to San Diego, and I was in such a hurry to pack them up that I forgot to take a picture! They were great travel food; not too smelly on the plane, and a big step up from any of the airport snacks. Preheat oven to 350 degrees and prepare a 12-muffin pan with paper liners. Chop thick stalks off of kale and slice remaining leaves very finely. In a heavy skillet over medium heat, saute chopped kale in olive oil for about seven minutes, stirring occasionally, until kale is very tender and starts to look a little dry. Set cooked kale on paper towels to drain and melt the butter in the skillet. In a large mixing bowl, stir together milk, melted butter, egg, minced garlic, and cooked kale until the egg is completely beaten. Add flour, baking powder, salt, pepper, and cheese. Stir until just combined; do not over mix. Fill twelve prepared muffin cups with batter– about 1/4 cup per muffin– and bake in preheated oven for 30 minutes. The finished muffins will be slightly browned and a toothpick inserted into a muffin should come out clean. Remove the pan from oven and allow muffins to cool completely before eating. The kale flavor in the muffins is very strong while the muffins are hot; it mellows as they cool, resulting in a great breakfast treat. The first time I saw daikon radishes at the farmer’s market I thought they were giant parsnips. I snapped up several, amazed at how inexpensive they were. What a surprise when I got home and realized I had purchased four radishes the size of my forearms! There are also several great recipes for warm radishes out there. When cooked, Daikon loses its crunch and forward flavor and softens into a mild complement for other ingredients. 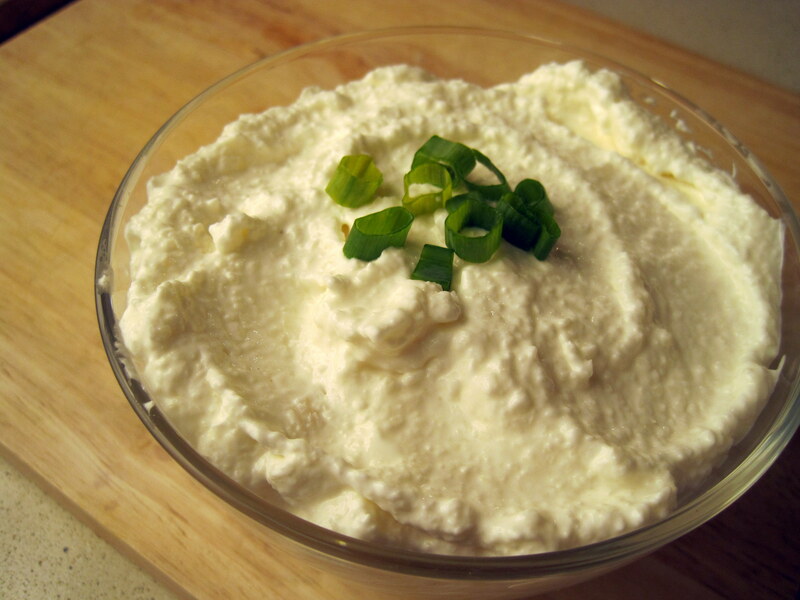 My favorite recipe for daikon radish is this creamy radish dip. Although it’s a significant step up over packaged ranch, this spicy white dip is about as accessible as the giant root gets. 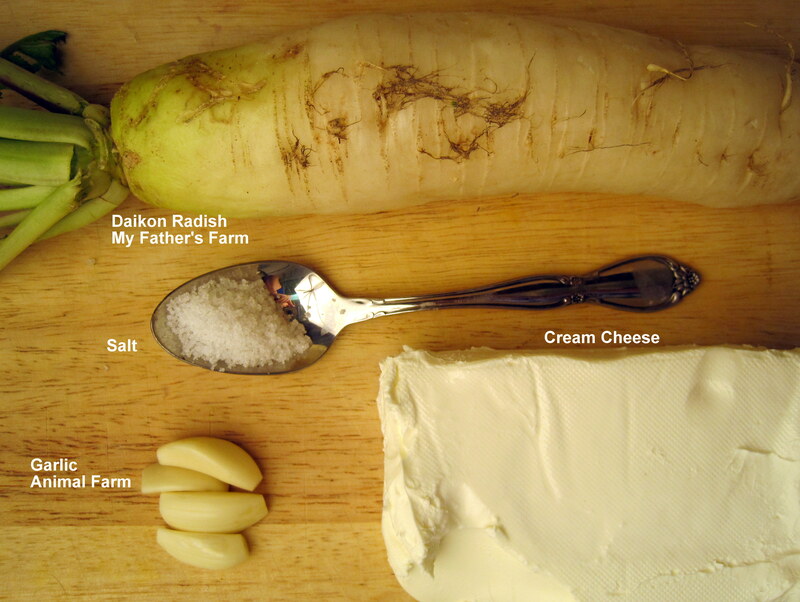 It makes for a wonderful introduction to daikon radish for kids or picky eaters. Plus, if you’re scrambling for an easy, last-minute potluck offering, this is your recipe! It has just four ingredients, and takes minutes to put together. If you don’t have daikon on hand, a bunch of red or black radishes work well in this recipe, too. Just know that the resulting dip will be pink or gray, according to the color of the radish skin. Persimmons and apples are a natural duet; the spicy sweetness of the persimmon is complemented by the apple’s tart flavor, and the flesh of both fruits are similar enough that they cook at the same speed. I originally conceptualized this apple-persimmon pairing as a filling for mini pies, but it has lots of other delicious uses. Preparing this compote is quick and easy. The most difficult part of the process is identifying which kind of persimmon you’re working with, and then peeling and coring fruit. There are two kinds of persimmons: Fuyu and Hachiya. Hachiya persimmons are heart-shaped, with pointy bottoms. Fuyus have flatter bottoms and look more like tomatoes. This recipe calls for the firm-fleshed Fuyus. However, you could substitute the pulp of very ripe Hachiyas if that’s what you have on hand. Here are detailed instructions for ripening and cooking with Hachiya persimmons. Below are instructions for coring and peeling apples and Fuyu persimmons. Here’s the full recipe. It doubles or triples well if you’re looking to feed a crowd, and the finished compote will last about a week in a tupperware in the fridge. Peel, core, and dice persimmons and apples. Melt butter over medium heat in a large skillet and saute fruit for about 5 minutes, until it starts to soften and give off a little liquid. Meanwhile, grate ginger and measure out cinnamon, vanilla, allspice, ground pepper, brown sugar, and rum. Add all ingredients to the skillet, cover and continue to cook over medium heat for about half an hour, until the fruit reaches desired tenderness. Stir occasionally and add a little water if necessary to keep compote from drying out. (Shouldn’t be a problem if your skillet’s covered, but burned brown sugar and fruit is no fun to clean up later!) Serve creatively and enjoy!